Contemporary designs find inspiration from any number of sources. 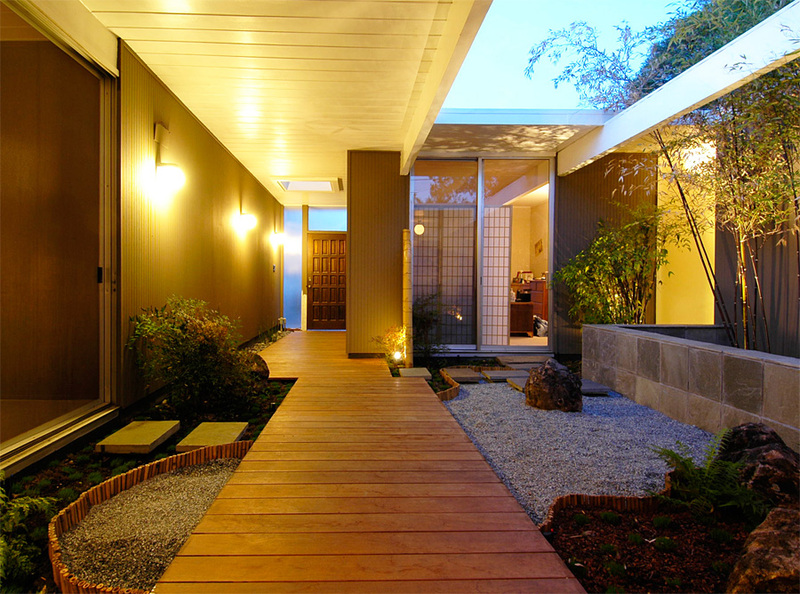 The Japanese sensibility of this Eichler entry, designed by Lisa Parramore, is readily apparent. 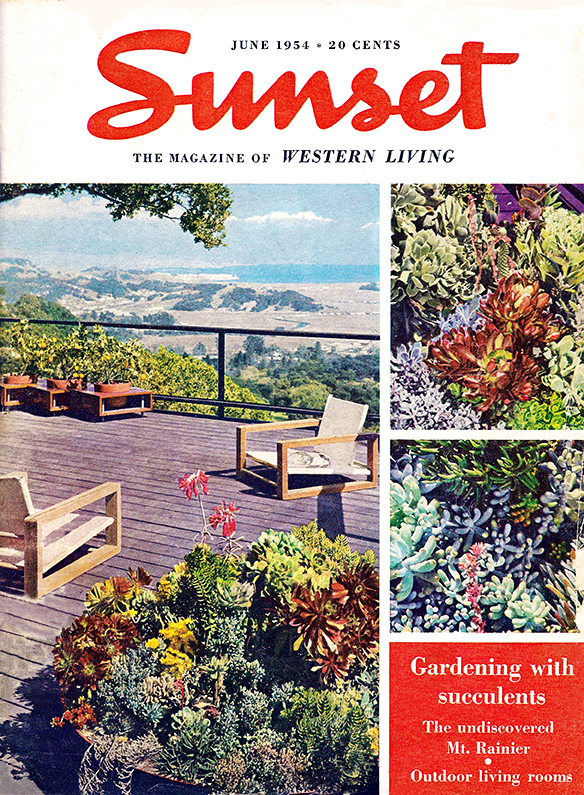 In this 1954 Sunset cover, the Robert Royston design for the deck in the photo has a very 'today' feel to it. While large expansive lawns were hallmarks of many mid-century modern homes when they were built, today people are pulling them out and doing water-wise plantings to save money on irrigation and to meet today's water restrictions. "Water conservation was not a hot topic then. Water was seen as abundant and unlimited," Miller says. "Today there is a strong emphasis on lower water and energy use, so you are no longer seeing expansive lawns. This is one of the challenges when working on a garden where a strong mid-century feeling is desired." Faux turf can substitute the look in some cases, but Miller warns that it must be used in the right place and in the right way, since it can often hold in heat and has its own maintenance concerns. Another approach is to use native plants for ground covers and ornamental grasses. While the extensive use of ornamental grasses is a contemporary innovation, grasses were also found in period photos of mid-century gardens. Blue fescue grass, often found paired with purple or dark green New Zealand Flax, was a favorite for small-scale ground cover. "Flax was a popular plant when the homes were new, and it always looks mid-century. Now there are dozens of Flax varieties to choose from," Miller says. "There is an emphasis on drama today. Mass planting of a single plant is used to achieve a strong effect that you did not see in mid-century gardens," Miller says. "It's really a matter of taste, and the beauty of houses like Eichlers is that you can play around and experiment. "I've worked with homeowners on true restorations of mid-century gardens, and I've done projects where the outcome looks nothing like the original—and they are both beautiful." Plant placement has also shifted in today's landscapes. Modern art inspired plant selection and placement in the '50s and '60s, which is why you would see the twisted form of a Mugo pine or a Hollywood juniper against blank walls with a fine-grain vertical texture. The goal was to create sculptural effect. This treatment still works today in combination with effective placement and spectacular uplighting.